The Swamp Croaker and Mud Jumper are two very underrated pets. With a team of these, you can knock out just about any other PVE team; even many of the heavy hitters of the pet dailies in the Garrison. Bubble, Swarm of Flies, and whichever ability is best for the situation in slot one. I love love this pet so much, I soloed Eleanor from the Pet Menagerie daily. Using Tongue Lash in slot 1, Swarm of Flies in Slot 2, and finally the epic Bubble!! I called him Bubbles hah. So I started out with Swarm, then bubble the charge, blocked two attacks and just spammed tongue flash! easy win with well over 300hp. Swamp Croaker is the best "critter" I've found for most PVE battles. He's my #1 pet off the bench against trainers when I need an undead matchup, and in my top 2-3 against elementals. Against undead set him up with tongue lash in slot one, flies in slot two, and bubble in slot three. As an aquatic pet he's strong in defense against Undead, which is typically why you're looking for a critter. Against elementals use water jet in slot 1. This is a very under-rated pet. With all the Unborn Val'kyr flying around out there in pet PvP battles, this little fella is the perfect solution to them. Loving it! 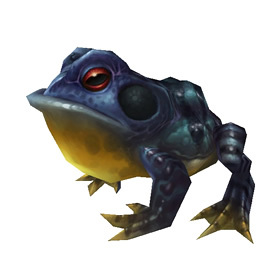 Not only is this guy a good looking frog, I'm excited about his croak and bubble abilities. I'm using an aquatic stone to upgrade the blue skin one I got since I find farming pets on the Isle of Thunder to be a lot of work (and a lot of dying for me). I was fortunate enough to get a Rare in the appropriately blue skin after a good prowl of the island and quite a few fights - my first time there. He may have been from the Violet Rise side of Diremoor, where that very large dino prowls, but otherwise there was nothing exceptional about the area in which I found him. Love him. I now use him to fight the Elemental Tamers instead of my Shimmershell Snail. IMO best 'frog' in the game, the Bubble is awesome. 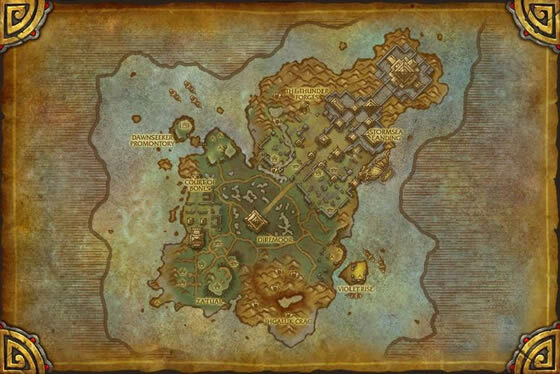 Found regularly throughout Isle of Thunder, personally I hunt mine near the Horde base, because there is a lotta grass and such uninhabited near it that pets seem to spawn on. I've seen these often & throughout the Isle so far. However, I've only gotten a poor ( which was the cool looking blue one, & released him since he was poor ), & an uncommon green one. Very nice looking frog! I'm hoping the rare will be a blue one though!! Have seen a couple of these around the court of bones at level 25. Have not been able to fight one yet though as my highest is currently only 22. 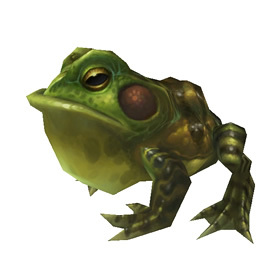 This has got to be the best frog model in the game. I love it! It (and the other pets) seems to be in rather short supply on the Isle I visit, however... I hope that's just because it's new and shiny. I seemed to find most of the spawns (unsurprisingly) around the pools in the Dire Moor. I have seen 2 skins. Green (shown) and Blue with a light underside. Probably best not to touch it.